I love looking at the four-selvedge textiles that the weavers here in Bolivia and Peru make. They give away some of the little secrets and “back stories”. The terminal area can give information about how the weaver set up the sheds on her warp as well as tell stories about how patient, tenacious and skilled he or she may have been. It generally goes that the smaller the terminal area is, the higher the weaver’s skill level was. 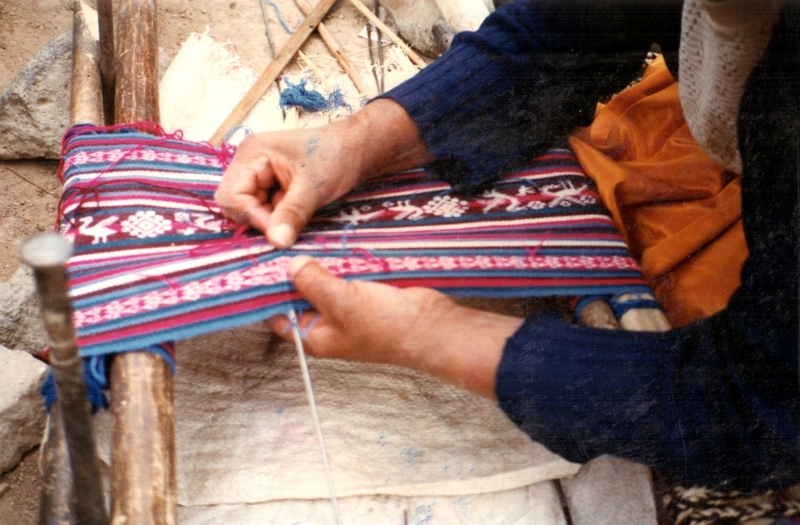 The terminal area is the part on a four-selvedge piece where the weaver finishes. The hand manipulated pick-up patterning suddenly ends and changes to rows of weaving where the weaver is simply passing the weft through the two sheds created by the heddles and shed-rod. The weaver will have started working at one end of her warp, woven a certain distance and then turned her warp around to start weaving from the other end. 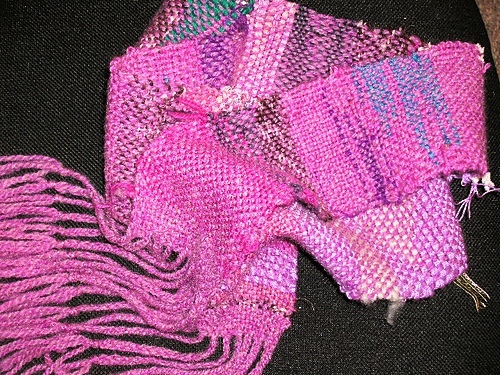 As the weaving progresses, the distance between the two ends of woven fabric slowly decreases. 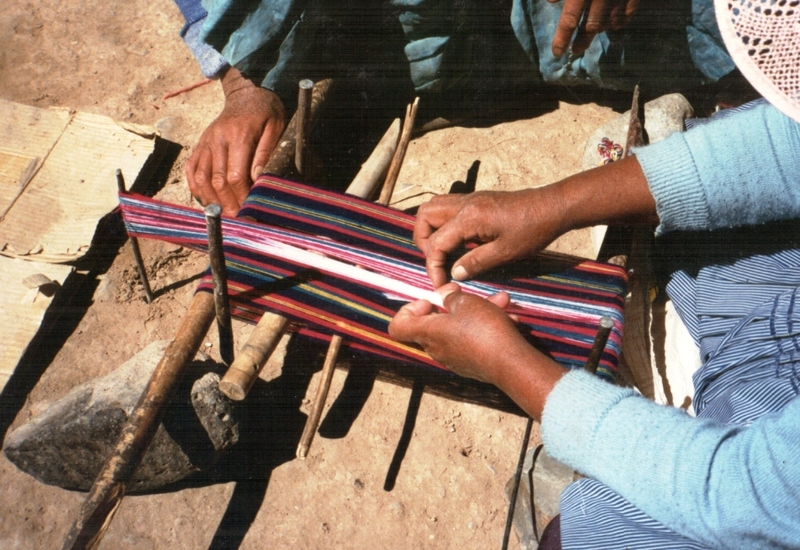 The weaver would eventually come to a point where there was so little space in which to work that it would be impossible to continue picking the patterns by hand. At this point he or she would simply open the two sheds without any patterning manipulations and pass the weft while substituting increasingly thin rods for the big shed stick. It’s the point at which the weaver decides that he or she simply cannot continue picking up warps by hand to form the pattern that shows the weavers skill or perhaps just his or her sheer tenacity. 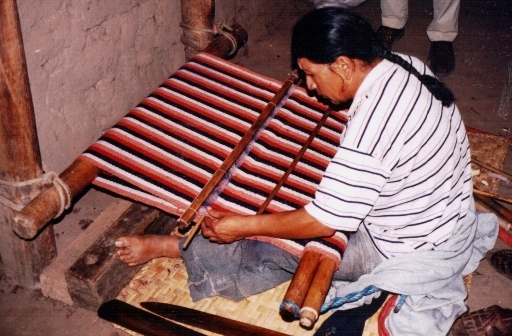 Some weavers just weave from one end and finish the weaving when they reach the other loom bar. Eventually the shed rod is removed and only the heddles are raised to open the tiniest gap through which the weft can be fed. The threads for every other shed must be painstakingly picked up one by one. The last few weft passes are actually needle woven. Good eyesight, patience, pride in one’s work and a strong desire for perfection are required. The terminal area on a plain-weave four-selvedge piece created by a skilled weaver will be difficult to spot. For people like me who like to look at textiles and figure out how they were woven, the information in the terminal area is a gift. 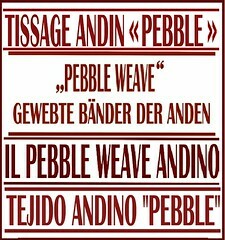 This fact came to mind this week as I was trying to figure out why the edges on the Bolivian double-weave belts that I have are so much neater than the double-weave pieces I make myself. I do everything my teachers in Potosi taught me yet there is something missing. Some weavers seem to have some special secret that enables them to create those sharp straight edges. My edge warps have a tendency sometimes to roll off the sides as the weft passes from the upper layer to the lower. This can at times produce bumpy edges although, as my boyfriend likes to point out, I am possibly the only one on this planet who notices them. I think all weavers know how that goes! Now the problem with examining belts is that they are most often not four-selvedge pieces. The ones I have from Potosi have three selvedges and end in tight braids and there is, therefore, no terminal area. No secrets or treasures of information are given away. So, this is what I did. 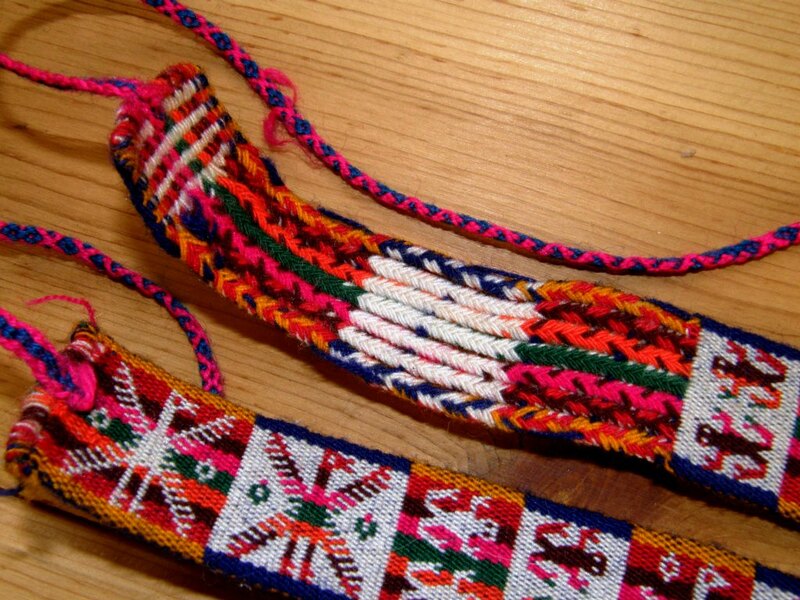 I took a deep breath and chopped the braid off one of my Bolivian belts to un-weave and find the hidden treasure. Sorry! Anyone who has done warp-faced double weave will know that un-weaving it is not fun. I made a mess and I won’t even show it to you but the good news is that I think, and I stress “think” I found the secret. I will probably be traveling up to the highlands next month where I hope to meet a weaver who can confirm this. I have been weaving a double-weave sample this week to see if I can improve the edges and also to see how the Bhutanese motifs that I wove last week with supplementary wefts look when woven in this technique. The motifs look so much more sumptuous woven with the supplementary wefts. That is how they were woven on the original textile from which I copied them but it was fun to see how they looked in double weave and also gave me something interesting to do as I wove my sample. I am pretty happy with this sample and shall have to find something I can use it for. I do believe the edges on the double weave piece look better than those I normally produce or is that just my imagination trying to justify my chopping up that poor belt?! I finished the fourth and final placemat in my set and was just about to celebrate when I found yet another lovely Mexican pattern in this warp float technique. But, no, that’s enough for the placemat project. I can use that pattern for something else. 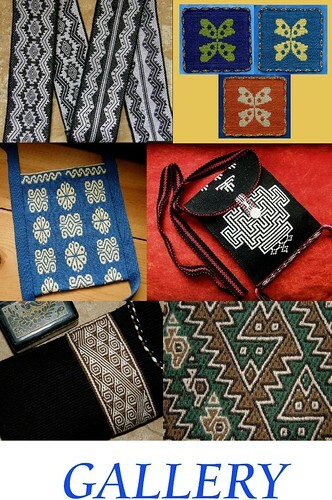 The fourth pattern comes from a storage bag from south west Iran which I saw on this site. Last week I showed you the blue one and its design which was inspired by Central Asian yurt band patterns. Verena, who wove with me on one of my US visits, has taken classes on how to construct a yurt and she gave me the link to the website of her teachers in Nova Scotia. 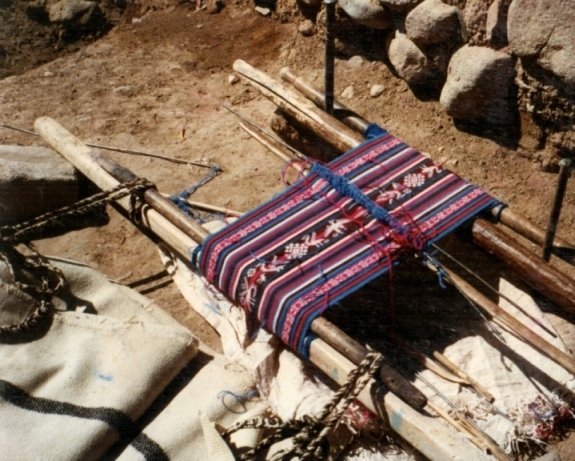 The web page has wonderful pictures of lessons in traditional weaving in Kyrgystan with images of the warping, set up and weaving. What’s next on the loom? The ideas are swirling around. Lately I have seen some lovely handmade bags which have incorporated all kinds of nifty compartments and pockets and so, I have decided to try and use the technique that my Bolivian teachers taught me for constructing a chuspa, (a bag for carrying coca leaves) with its little built-in pocket to make a bag and pocket all in one piece. I haven’t woven one of these since I studied with Julia and Hilda and so I have had to get out the giant journal to consult. Hopefully I have done a good job of documenting the process. Sometimes when the memory of the process has started to fade, I return to my written instructions and find that I didn’t include as much detail as I should have. What I normally do is try to consolidate everything immediately on my return by weaving more examples and then I repeat the process at intervals and add to and improve my written instructions. So, my aim is to make a bag with a pocket all in one piece. A lot of the chuspas here are woven with such pockets. Some of the pockets are so tiny that it is obvious that they were woven as a decoration and couldn’t possibly have any sort of practical use. I guess it is included in many cases simply because it is customary to do so. This is the chuspa that I made with my teachers. You can see the wee pocket which has been edged with cross knit looping. 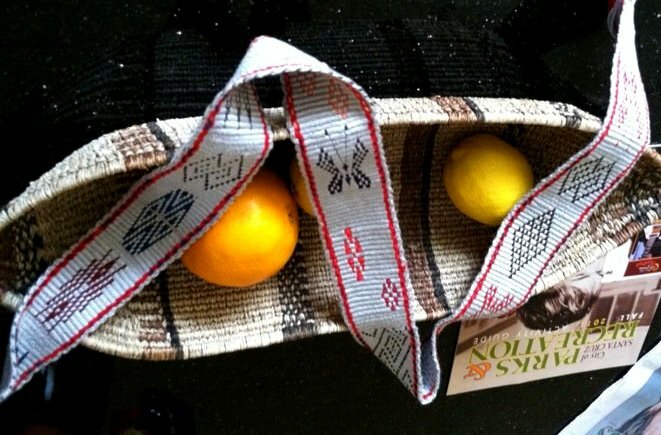 The pocket on the traditional chuspa is only accessible from the inside of the bag. I want to have a pocket that I can get into on the outside so that I can easily reach keys, a cellphone or any other treasure that I need to have hidden but in easy reach. When I turn my chuspa inside out I have such a pocket. It was fun seeing the other side of this weaving with its reversed colors for a change which hasn’t seen the light of day since 1997 when I wove this piece. This probably seems like a ridiculously complicated way to go about having a pocket in a bag but remember that I am pretty much all about process rather than product and this exercise will serve more than one purpose. I would like to weave this bag in the traditional way I was taught by my Bolivian teachers and see if my written instructions are up to scratch. The chuspa I wove in Potosi is a four-selvedge piece. The one I plan on doing now won’t be! Well, not this time anyway. Maybe I will do that later when I have enough handspun. I am going to weave a simple plain test bag first in cotton.. It was interesting to see that even my weaving teachers were forgetting the process and there was much bickering between the two sisters over how it should be done! Here are their two pairs of hands at work setting up the horizontal loom. As I have been playing around with double-weave this week, I am going to try and put together a tutorial on the two-weft version for the blog next week. I made a tutorial for this on Weavolution ages ago and I think it could use some better photos and an update. 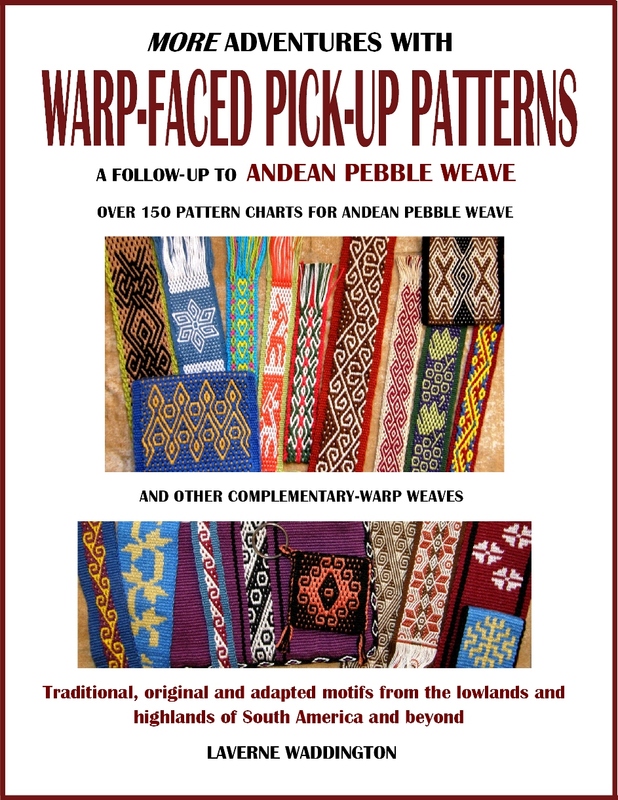 The two-weft version allows you to weave bands of double-weave patterns next to regular plain weave. 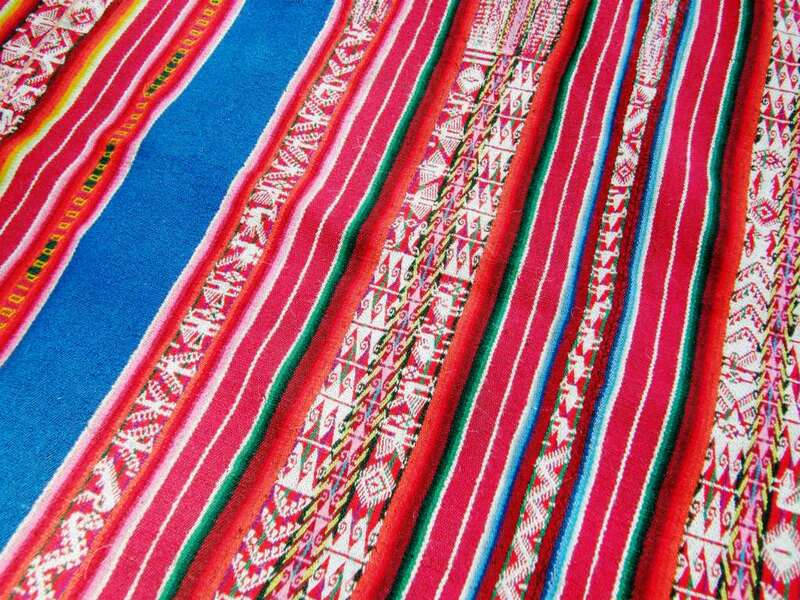 This piece from Charazani, Bolivia, which is part of Yonat’s textile collection, has been woven in such a way. 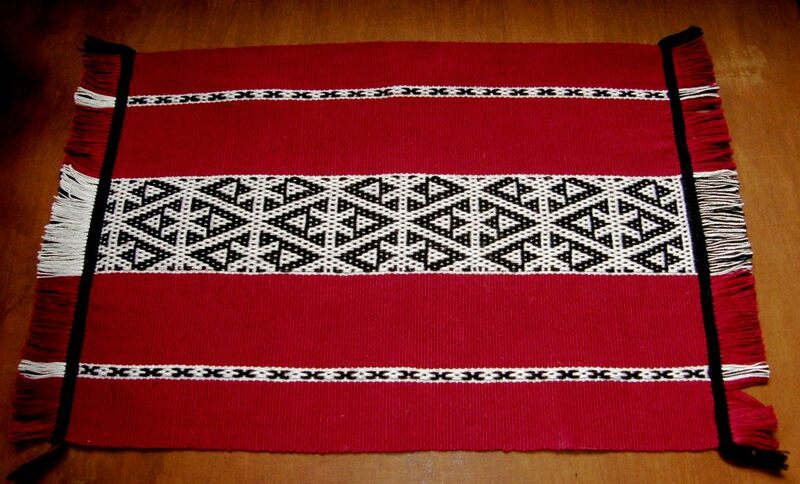 Motifs can be woven on narrow bands with the smooth solid color background that double weave produces. The bands sit within fields of solid color and stripes which are regular warp-faced plain weave. You can clearly see the terminal area. Finishing a four-selvedge double-weave piece is particularly hard as you have twice the amount of warps to deal with. Trust me, I have done it! This is the technique I wove on the very first four-selvedge piece I made. My teacher and I shared the burden of finishing the piece. I will leave you here with some projects from online weaving friends and people I wove with on my US trip last spring. Dwayne was having some problems getting his very first project underway. He didn’t have a nice smooth cotton yarn to work with and was struggling with making the string heddles. Now he is weaving using inkle-type heddles clamped between two dowels. Let’s weave! The continuous string heddles can be practiced later! He has a lovely Guatemalan loom to use. This almost makes me wish I lived in a colder climate so I too can make scarves. Yonat wove supplementary weft patterning with me in California and has just showed me her band made with #10 crochet cotton on which she has been practicing the technique. She really has this down! I also have a tutorial on this in Spanish. 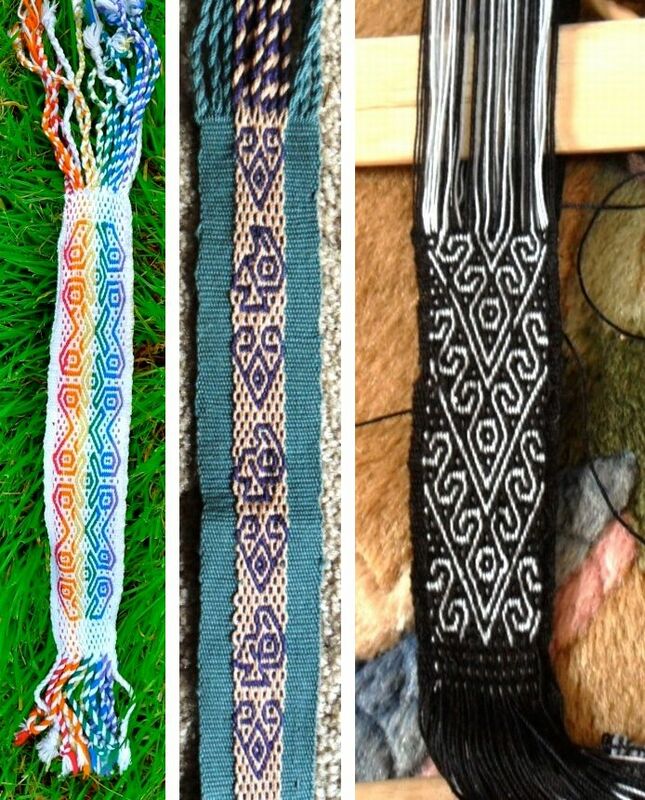 And Verena has been busy with pebble weave…. And that’s it for another week. Now to get my chuspa idea under way. There are bound to be lots of lessons learned in this project! 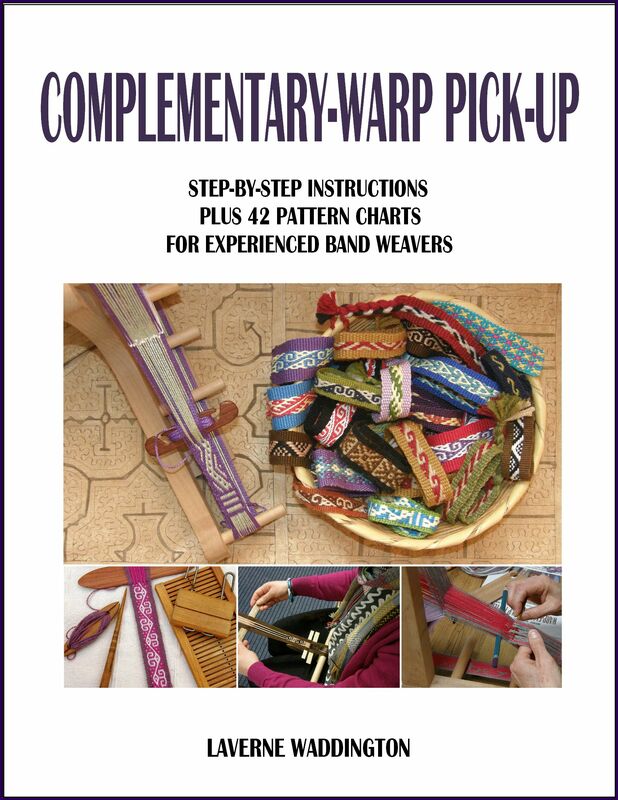 « Backstrap Weaving – “Click, Click” weave weave. Hi, just have to tell you how much I look forward to and enjoy your weekly blog updates! I am a beginner in weaving and have spent my time so far just getting the “feel” of the skill on frame looms. Each learning cure achieved is so exciting. My GOAL though is backstrap weaving and you definitely keep my desire a flame!! Thank you for ALL you share and teach us! I’d enjoy your blog and work even if I didn’t do any weaving! Interesting to look at the loom (following the Krygystan link in this week’s blog) with the loom in Sierra Leone ( http://adireafricantextiles.blogspot.com/2011/06/tripod-loom-in-sierra-leone.html ). Always a lot to look at, enjoy, and learn from. Thanks! 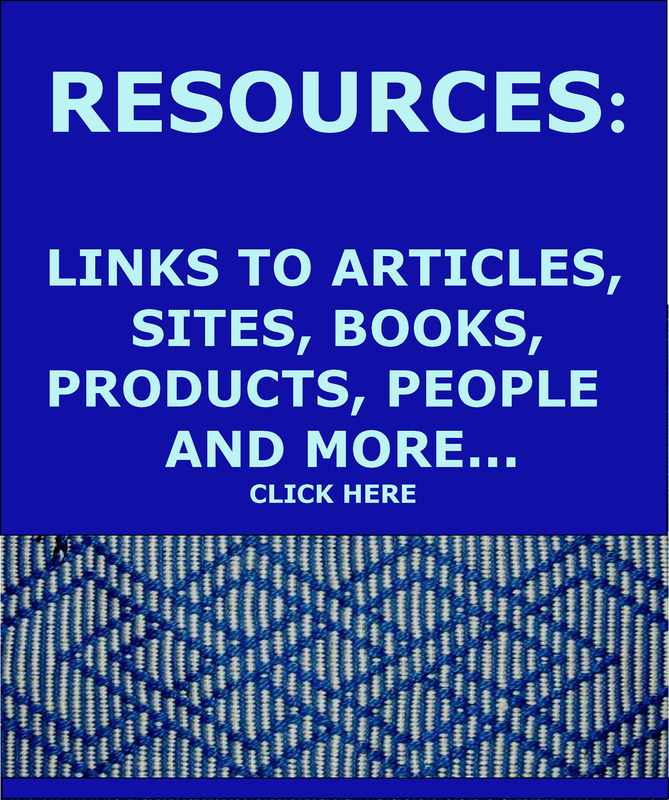 Hi Laverne–Thanks again for all your posts, your blog is a treasure trove. Congratulations on your forensic unweaving! What I am really curious about (for selfish reasons!) is how your weaving journal is held together–Is that just a huge 3-ring binder???? p.s.I LOVE the purple and white double weave version of those motifs! Hi Ingrid. Thanks for the nice comments. My journal started as a slim spiral-bound notebook and then got completely out of control. So I ended up gluing tabs to the pages so I could glue two pages side by side and then folded and sewed them together in sections. Then I glued all the sections to some webbing, added a hard cover etc…all guess work from looking at books and trying to figure out how they are put together. I have another huge one like that just on Ecuador and then six slimmer ones. I love making them.